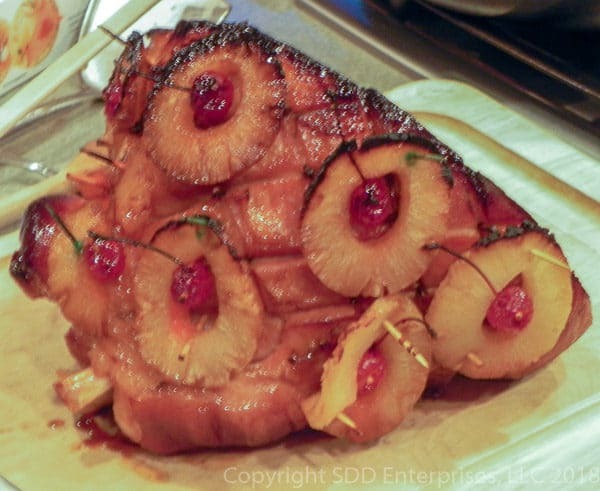 Smoked ham, dressed with pineapple slices and cherries, topped with a sweet glaze and slowly baked to perfection. Sweet Daddy D’s Baked Ham is the ideal centerpiece for any holiday meal or other gathering of friends and family. A baked ham is the perfect centerpiece for any holiday meal or other gathering of friends and family. A simple sweet and tasty glaze puts this in a class by itself. 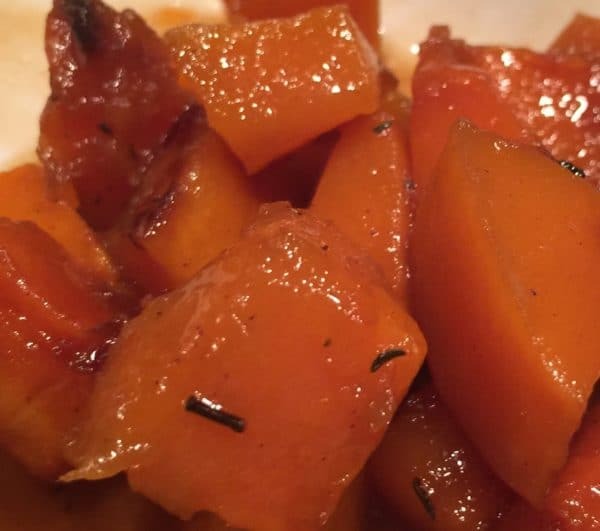 There are almost endless ways to serve this and endless possibility for side dishes. Everyone will go crazy over this....and maybe the best part-it makes the best leftovers. Unwrap the ham and trim off some of the hard rind and excess fat. Make sure to leave a nice ¼ inch layer of fat on the ham. 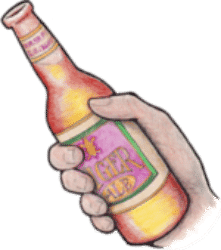 Mix the can of root beer with the pineapple juice form the slices. Score the ham in a cross-hatch design and place one whole clove at each intersection. Place the ham in a roasting pan. Pour the pineapple/root beer over the top of the ham in the pan. 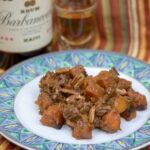 The excess liquid will remain in the pan and mix with rendered juices while roasting and make an excellent basting liquid. Place the ham in the pan on the oven. Combine the glaze ingredients, mix well and set aside. Get the pineapple slice and cherries ready. After one hour, remove the ham from the oven and baste well with the pan juices. 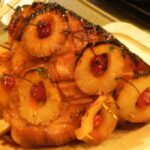 Place the pineapples all over the top of the ham in a single layer and place a cherry in the center hole of each slice. Secure all to ham with the toothpicks. Return the ham to the oven. In a couple of hours check the internal temperature with an instant read thermometer. Keep monitoring the IT and when it reaches 135 degrees, remove the ham again from the oven and increase the temperature to 400 degrees. Baste the ham well with the pan juices. Pour the glaze all over the top of the ham making sure to get some over all the pineapples and the face of the ham. Return to the 400 degree oven. Continue to bake for another 30 to 45 minutes until it reaches 145 degrees internal temperature and the glaze is browning a bit. If it is browning too fast, tent with aluminum foil until its ready. Remove the ham from the oven and allow it to rest for about 30 minutes before slicing. The ham label should say fully cooked, water added, ready to eat. 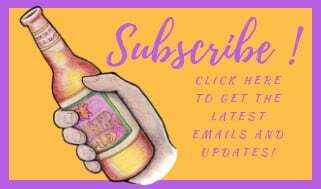 If you want more information about ham labeling, please check out this lagniappe post. Remember to save that ham bone! Take a smoked ham and throw it on the smoker..you've got Double Smoked Ham. Delicious smoke flavor accented with a sweet and savory topping of pineapple slices and cherries covered with a sugary glaze. This will be very popular! Combine the pineapple juice from the can of pineapple slices with 1 can of root beer and mix well. While still in the cryowrap the ham came in, inject several squires of the pineapple/root beer solution all over the ham. Allow this to rest still wrapped while you prepare your smoker. Prepare your water smoker according to your regular process for a targeted temperature of about 275 degrees. Use a few chunks each of cherry and pecan wood. While waiting on the smoker to be ready, unwrap the ham and trim off some of the hard rind and excess fat. Make sure to leave a nice ¼ inch layer of fat on the ham. Place the ham in an aluminum pan or other suitable container for the smoker. Pour the remainder of the pineapple/root beer plus one more can of root beer over the top of the ham in the pan. The excess liquid will remain in the pan and mix with rendered juices while smoking and make an excellent basting liquid. Place a probe thermometer in the ham to monitor the internal temperature (IT) throughout the cook. The desired IT when finished will be approximately 145 degrees. Place the ham in the pan on the smoker. Monitor the smoker temperature and try not to go below 275 degrees or over 325 degrees if possible. When the IT reached approximately 110 degrees, remove the pan form the smoker and attach pineapple slices in a single layer over the top of the ham and place a cherry in the whole of each pineapple slice. Secure all with toothpick. Baste the ham with the pan juices thoroughly. Pout the glaze over the top of the ham making sure to cover the entire ham. Return the ham to the smoker. Adjust the vents to increase temperature to a minimum 300 degrees. When the IT reached 140 degrees, begin to verify using an instant read thermometer. Remove the ham from the smoker when the IT is 145 degrees. Baste well and tent with aluminum foil. Allow to rest for about 30 minutes before slicing. The ham label should say fully cooked, water added, ready to eat. The ham will be cryowrapped and, if injecting, should be done so while still wrapped in the cryowrapping.